Cristiano Ronaldo and Antoine Griezmann scored within five minutes of each other as Real and Atletico ended the match with a point apiece. It was a pulsating first half that surprisingly didn’t have any goals. While Atletico were pegged back into their box for most of the half and indeed the match, they were quite vicious on the counter and Keylor Navas had almost as much work to do as Jan Oblak. The second half started and Real Madrid drew first blood with Cristiano Ronaldo scoring his 20th goal in 10 games. But Atletico responded quickly and Antoine Griezmann brought things back to an even keel just minutes later. It was all a bit scrappy after that it remains to be seen whether Lucas Vazquez will be able to play next week’s Champions League fixture after he twisted his ankle. Those four crazy minutes in the early part of the second half are the only times we saw the net bulging and since then, it has been a rather scrappy affair. But it has been a real humdinger of a match. You can hop over to the IPL Live blog we have going to check out what is happening there. Thanks for tuning in, tata! The resulting corner is floated in and Ramos heads it and it is just over the bar. Two close shots in a minute fro the Real captain. Isco fouled just outside the box and free kick given to Real. Bale, Ramos, Isco all standing and it is Ramos who takes it and is curling towards the top left corner, Oblak makes an excellent save. Marcelon runs in from the right skipping past three Atletico defenders inside the box and passes it to Kroos who takes the shot from about 15 yards out, it is over the bar. Vazquez back on the pitch but he is clearly struggling. Real are hence playing with somewhere between 10 and 11 men. But they are hogging possession and keeping Atletico busy. 10 man Real caught out Griezmann and Correa run forward with the ball high up in the air, it falls left side of the box and Griezmann takes it down brilliantly but he can't find Correa who is standing all alone inside the box. That was a proper chance for Atletico. Vazquez screaming in pain again this time after twisting his ankle by the byline. That does look painful and he comes out to receive treatment. The match is being played almost exclusively near the Real box now. Marcelo makes a cross from the right and Bale rises, doesn't quite catch hold of it and the ball goes out of play. Godin clips Vazquez on the lips as the two vye for a cross that flies well over both their heads. It is inside the box and Vazquez goes down but the referee notes that it couldn't have been intentional and just gives a throw in. Atletico break with Griezmann setting Saul free. Saul doesn't have the kind breakneck speed to leave the Real defence behind though and he could have passed it to Costa instead of what he ended up doing - taking a shot from 30 yards out. Costa is subbed off after that for Gabi while Modric and Isco come on Asensio and Kovacic. After all that frenzy, a dull spell. Real are passing the ball around leisurely, Atletico springing up only when they come a bit too close to the box. Bale is fouled by the left hand touchline and he rubs his knees a bit. No real problems though, although every time Bale clutches his knee, one does pray it doesn't mean a six-week spell on the hospital bed. 64 mins, Benzema comes on for...Cristiano Ronaldo! Zidane has managed Ronaldo's game time in La Liga and there is no doubt that he has one eye on Juve's visit to the Bernabeu next week in the Champions League. 59 mins What a save from Navas! Koke lasers in a shot from a cross that isn't cleared away and Navas makes an absolute beauty of a save. Suddenly Atletico breathing fire. What a match this is! What a response! Atletico get on Real's throats as soon as play restarts. Partey plays in Griezmann wh passes it to Vitolo. Vitolo's touch takes the ball away from Navas and Griezmann passes it into the empty net. Game On! It just had to be him. Gareth Bale with cross from the left and Ronaldo is at the far post, he stretches and meets the ball with his feet. It is the perfect connection and it goes past Oblak, Real ahead. Meanwhile, in a land far far away from Eden, Altetico set the ball rolling for the second half. Any AB de Villiers fans in the house? AB de Villiers has arrived and is going berzerk with Virat Kohli enjoying the show at the non-striker's end at Eden Gardens in the third match of IPL 2018. Click here to check out what is happening there. Pulsating is the one word that describes this half best. Real have had more possession and more chances but it looks like this is what Atletico had planned. The away side have had their own fair share of chances and looked fairly solid in defence. Having said that, though, Real have had some very good chances and Simeone will be asking his defence to plug those gaps that they exploited in the first half. Real are raining in the attacks now, Ronaldos shot rebounds and Bale lays it off for Marcelo on the right, the Braziliant cuts in and tries to curl it in and it hits the bar and back into play! Carvajal volleys the rebound and Oblak makes a brilliant save diving to his right. In the ensuing corner, Ramos clotheslines Lucas. Referee doesn't book him but Ramos is living on the edge here. As stated before, everything is normal. Bale, playing down the right now, puts in a cross looking for Ronaldo in the middle, the Portuguese rises above the Atletico defenders but the ball has too much on it, it falls to Vazquez at the far post and he goes down, Real appeal for a penalty, nothing doing, says the referee. Atletico passing the ball around on the right hand side before Saul passes it to Diego Costa at the edge of the box, Costa is unable to control it and the clearance takes a deflection off him and goes for a Real thrown in. He doesn't think so of course. Big chance there for Diego Costa. Costa picks up the ball from the inside right channel and he is onside, almost one on one with Navas but the Chilean manages to make the save. Costa has been simmering over the last few minutes, picking fights with Marcelo and getting in the referee's face whenever there is a decision against him. Everything is normal then. Very strange game so far, not too cagy or open really. Real remain the side doing with a lion's share of attacks but Atletico are looking dangerous whenever they do manage to counter. Ronaldo is fouled by Juanfran in line with the D near the left touchline. Atletico counter, Costa somehow slips and stumbles his way into the box, loses his balance and falls down, the ball runs loose for a second in the box and Navas comes out to take it before Costa regains his bearings. Cristiano Ronaldo unleashes a lazer of a shot that is rising and falling and doing all sorts of bad things on its 25 yard journey to goal, Oblak just about manages to tip it over. Asensio gets the ball on the left with some space in the box after the resultant corner is cleared and he looks to chip it over Oblak, the ball goes behind. Well not too much happening except that Atletico got their first corner of the game when Marcelo intercepted a cross and blasted it out of play. Vazquez with a cross from the right trying to find Ronaldo, Godin heads it out for a corner. Kroos takes, Ramos and Bale rise but the ball goes behind, Ronaldo is there at the far post and his shot is straight at Oblak. Corner for Real that Kroos takes short, a one-two with Marcelo and he sends the ball in trying to find Ronaldo, Atletico block the cross but Marcelo tries a shot from the rebound, blocked again. Real Madrid kick off the match at the Bernabeu attacking from right to left for the first half. Both sides are in their regular colours. Both sides have come with their big guns with Gareth Bale being a noteworthy presence, Karim Benzema and Isco are on the bench for this one but we can expect them to play a role later on. No surprises from Atletico, Griezmann and Costa start as always. One could say, though, that the dropping of Benzema and Isco and the presence of Bale in the line-up indicates that Real are still have the Juve clash coming next week on their minds. Or El Derbi madrileño, for those interested in languages. The Madrid derby has been a staple of the Champions League knockout stages over the last few years. In Europe, despite Atletico Madrid's upturn in fortunes over the past few years, this match has been a lopsided affair. Since 2013/14 season, when Atletico won La Liga and reached the final of the Champions League where they faced Real, Los Blancos have won five of the six matches played so far. In the league, though, the story has been quite different. 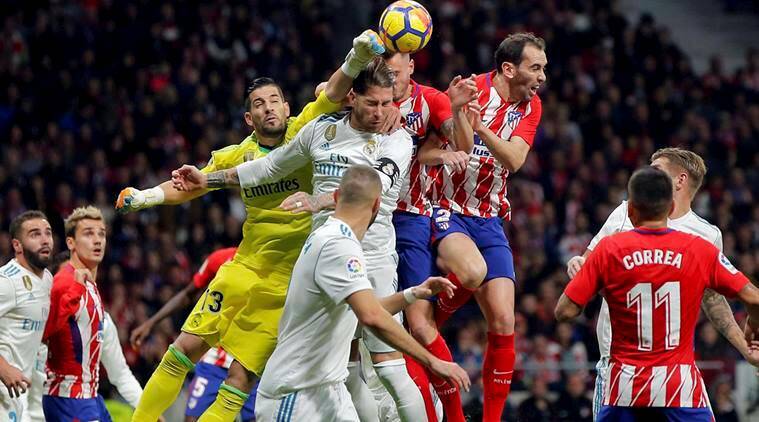 The two sides have played nine matches since Atletico's title-winning season and Real have managed to win just one of them; Atletico have won four. This season, there will be no Madrid derby in Europe. However, Real are on the lookout for a third Champions League title while Atletico are looking for success in the Europa League. But this match is not devoid of any importance. Real are third in the league trailing second-placed Atletico by four points and, more importantly, leading fourth-placed Valencia by just one. A win for Zinedine Zidane's side would boost their chances of finishing in the top four or even manage a second-placed finish. It would also mean good news for Barcelona as the gap between the league leaders and second-placed Atletico would remain 12 points with seven games left to play. The Madrid derby was a lopsided affair for a long time. While both the clubs are based in the same city, the histories of Real and Atletico couldn't be farther apart. Where Real are one of the behemoths of world football, Atletico are a new brand, the renegades who broke the duopoly that their cross-town rivals shared with Barcelona over La Liga in 2014. Real are one of the three teams alongwith Barca and Athletic Bilbao to have never got relegated in more than a century of La Liga while Atletico have had their fair share of experience in the lower tiers - their last promotion to La Liga was in 2001 after two years in the Segunda division. Under Simeone though, Atletico have enjoyed a spectacular rise in stature in the current decade and despite that, the Argentine never fails to remind the press of the gulf between his side and the two Spanish giants.